King William's War (1688–1697, also known as the Second Indian War,[a] Father Baudoin's War, Castin's War, or the First Intercolonial War in French) was the North American theater of the Nine Years' War (1688–97), also known as the War of the Grand Alliance or the War of the League of Augsburg. It was the first of six colonial wars (see the four French and Indian Wars, Father Rale's War and Father Le Loutre's War) fought between New France and New England along with their respective Native allies before France ceded its remaining mainland territories in North America east of the Mississippi River in 1763. For King William's War, neither England nor France thought of weakening their position in Europe to support the war effort in North America. New France and the Wabanaki Confederacy were able to thwart New England expansion into Acadia, whose border New France defined as the Kennebec River in southern Maine. :27 According to the terms of the 1697 Treaty of Ryswick that ended the Nine Years' War, the boundaries and outposts of New France, New England, and New York remained substantially unchanged. At the end of the 17th century, English settlers outnumbered the French, although the English were divided into multiple colonies along the Atlantic. The English settlers were more than 154,000 at the beginning of the war, outnumbering the French 12 to 1. However, they were divided in multiple colonies along the Atlantic coast, which were unable to cooperate efficiently, and they were engulfed in the Glorious Revolution, creating tension among the colonists. In addition, the English lacked military leadership and had a difficult relationship with their Iroquois allies. New France was divided into three entities: Acadia on the Atlantic coast; Canada along the Saint Lawrence River and up to the Great Lakes; and Louisiana from the Great Lakes to the Gulf of Mexico, along the Mississippi River. The French population amounted to 14,000 in 1689. Although the French were vastly outnumbered, they were more politically unified and contained a disproportionate number of adult males with military backgrounds. Realizing their numerical inferiority, they developed good relationships with the indigenous peoples in order to multiply their forces and made effective use of hit-and-run tactics. For further details on the war's European causes, see Nine Years' War and Glorious Revolution. England's Catholic King James II was deposed at the end of 1688 in the Glorious Revolution, after which Protestants William III and Mary II took the throne. William joined the League of Augsburg in its war against France (begun earlier in 1688), where James had fled. There were similar tensions on the border between New England and Acadia, which New France defined as the Kennebec River in southern Maine. :27 English settlers from Massachusetts (whose charter included the Maine area) had expanded their settlements into Acadia. To secure New France's claim to present-day Maine, New France established Catholic missions among the three largest native villages in the region: one on the Kennebec River (Norridgewock); one further north on the Penobscot River (Penobscot) and one on the Saint John River (Medoctec). For their part, in response to King Philip's War, the five Indian tribes in the region of Acadia created the Wabanaki Confederacy to form a political and military alliance with New France to stop the New England expansion. In April 1688, Governor Andros plundered Castine's home and village on Penobscot Bay (Castine, Maine). :607 Later in August, the English raided the French village of Chedabouctou. In response, Castin and the Wabanaki Confederacy engaged in the Northeast Coast Campaign of 1688 along the New England/Acadia border. They began August 13, 1688, at New Dartmouth (Newcastle), killing a few settlers. A few days later they killed two people at Yarmouth in the first battle. At Kennebunk, in the fall of 1688, members of the Confederacy killed two families. The following spring, in June 1689, several hundred Abenaki and Pennacook Indians under the command of Kancamagus and Mesandowit raided Dover, New Hampshire, killing more than 20 and taking 29 captives, who were sold into captivity in New France. In June, they killed four men at Saco. In response to these raids, a company of 24 men was raised to search for the bodies and pursue the natives. They were forced to return after they lost a quarter of their men in conflicts with the natives. William Phips, the Governor of the Province of Massachusetts Bay, led an assault on Port Royal. In Church's second expedition to Acadia, he arrived with 300 men at Casco Bay on 11 September 1690. His mission was to relieve the English Fort Pejpescot (present-day Brunswick, Maine), which had been taken by the Wabanaki Confederacy. :179–180 He went up the Androscoggin River to Fort Pejepscot. :66 From there he went 40 miles (64 km) upriver to Livermore Falls and attacked a native village. Church's men shot three or four native men when they were retreating. Church discovered five English captives in the wigwams. Church butchered six or seven natives and took nine prisoners. :67 A few days later, in retaliation, the members of the Wabanaki Confederacy attacked Church at Cape Elizabeth on Purpooduc Point, killing seven of his men and wounding 24 others. :69 On September 26, Church returned to Portsmouth, New Hampshire. On July 18, 1694, French soldier Claude-Sébastien de Villieu with about 250 Abenakis from Norridgewock under command of their sagamore (paramount chief) Bomazeen (or Bomoseen) raided the English settlement of Durham, New Hampshire, in the Oyster River Massacre. In all, the French and native force killed 45 inhabitants and took 49 captive, burning half the dwellings, including five garrisons. They also destroyed crops and killed livestock, causing famine and destitution for the survivors. In 1699, a military campaign saw the sacking of English settlements on the Avalon Peninsula. In retaliation, Church went on his fourth expedition to Acadia and carried out a retaliatory raid against Acadian communities on the Isthmus of Chignecto and Fort Nashwack (present-day Fredericton, New Brunswick), which was then the capital of Acadia. :215 He led his troops personally in killing inhabitants of Chignecto, looting their household goods, burning their houses and slaughtering the livestock. French batteries bombard the English fleet during the Battle of Quebec. This was followed by two expeditions. One, on land under Connecticut provincial militia general Fitz-John Winthrop, targeted Montreal; the other, led by Sir William Phips, targeted Quebec. Winthrop's expedition failed due to disease and supply issues, and Phips was defeated in the Battle of Quebec. The Quebec and Port Royal expeditions were the only major New England offensives of King William's War; for the remainder of the war the English colonists were primarily engaged in defensive operations, skirmishes and retaliatory raids. The Iroquois Five Nations suffered from the weakness of their English allies. :290 In 1693 and 1696, the French and their Indian allies ravaged Iroquois towns and destroyed crops while New York colonists remained passive. After the English and French made peace in 1697, the Iroquois, now abandoned by the English colonists, remained at war with New France until 1701,:291 when a peace was agreed at Montreal between New France and a large number of Iroquois and other tribes. Sinking of the Pélican after the Battle of Hudson's Bay. Although victorious in battle, Pélican sustained damaged and subsequently sunk. The war also served as a backdrop for an ongoing economic war between French and English interests in Arctic North America. The Hudson's Bay Company had established trading outposts on James Bay and the southern reaches of Hudson Bay by the early 1680s. 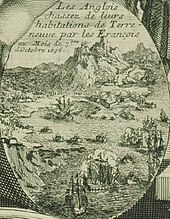 In a series of raids, beginning with the so-called Hudson Bay expedition, organized by Governor Denonville and continuing through the time of the Nine Years' War (1688-1697), most of these outposts, including Moose Factory, York Factory and Fort Albany, were taken by French raiders, primarily led by Pierre Le Moyne d'Iberville. But the French forces were small, and their hold on the captured posts quite weak — York Factory was recaptured by the English in 1695. In 1697, in the Battle of Hudson's Bay, one of the war's major naval battles, d'Iberville, with a single ship, defeated three English ships and went on to again capture York Factory. The Treaty of Ryswick signed in September 1697 ended the war between the two colonial powers, reverting the colonial borders to the status quo ante bellum. The peace did not last long; and within five years, the colonies were embroiled in the next phase of the colonial wars, Queen Anne's War. After their settlement with France in 1701, the Iroquois remained neutral in that conflict, never taking part in active hostilities against either side. Tensions remained high between the English and the tribes of the Wabanaki Confederacy, who again fought with the French in Queen Anne's War, with conflict characterized by frequent raids in Massachusetts, including one on Groton in 1694, in which children were kidnapped, and the Deerfield Massacre in 1704, in which more than 100 captives were taken north to Montreal for ransom or adoption by Mohawk and French. By the end of the war, natives were successful in killing more than 700 English and capturing over 250 along the Acadia/ New England border. Scholars debate whether the war was a contributing factor to the Salem witch trials. King William's War as well as King Philip's War (1675–78) led to the displacement of many refugees in Essex County. The refugees carried with them fears of the Indians, which is debated to have led to fears of witchcraft, especially since the devil was arguably closely associated with Indians and magic. Of course, Cotton Mather also wrote that it was going to lead to an age of sorrow and is arguably a proponent in leading Salem into the witchcraft crisis of 1692. Scholars debate this theory and one scholar, Jenny Hale Pulsipher, maintains that King William's War was more of a cause. Other scholars that have written on the theory of the wars being a leading cause of the Salem Witchcraft Trials include Mary Beth Norton, James Kences, and Emerson Baker. ^ The first Indian War is better known as King Philip's War, the Third Indian War was Queen Anne's War, the Fourth Indian War was Father Rale's War, the fifth was King George's War, and the sixth was the French and Indian War. ^ a b Baudry, René (1979) . "Thury, Louis-Pierre". In Brown, George Williams (ed.). Dictionary of Canadian Biography. I (1000–1700) (online ed.). University of Toronto Press. ^ Taylor, Alan (2005). Writing Early American History. University of Pennsylvania Press. p. 74. ISBN 0-8122-1910-4. ^ a b Williams, Alan F. (1987). Father Baudoin's War: D'Iberville's Campaigns in Acadia and Newfoundland, 1696, 1697. Department of Geography, Memorial University of Newfoundland. ISBN 978-0-88901-144-1. ^ a b Sylvester, Herbert Milton (1910). Indian Wars of New England: The Land of the Abenake. The French Occupation. King Philip's War. St. Castin's War. Vol. I. Boston: W.B. Clarke Company. p. 54. ^ Lacoursière, Jacques; Provencher, Jean; Vaugeois, Denis (2001). Canada-Québec 1534-2000. Les éditions du Septentrion. p. 92. ISBN 978-2-89448-186-8. ^ Bromley, J. S., ed. (1971). The New Cambridge Modern History: Volume 6, The Rise of Great Britain and Russia, 1688-1715/25. Cambridge University Press. p. 488. ISBN 978-0-521-07524-4. ^ a b c Williamson, William D. (1832). The History of the State of Maine: From Its First Discovery, A. D. 1602, to the Separation, A. D. 1820, Inclusive. Vol. II. Glazier, Masters & Smith. ^ Campbell, William Edgar (2005). The Road to Canada: The Grand Communications Route from Saint John to Quebec. Goose Lane Editions. p. 21. ISBN 978-0-86492-426-1. ^ a b c Pulsipher, Jenny Hale (December 2007). "Dark Cloud Rising from the East" (PDF). The New England Quarterly. 80 (4): 588–613. doi:10.1162/tneq.2007.80.4.588. JSTOR 20474581. ^ McIlwraith, Thomas F.; Muller, Edward K. (2001). North America: The Historical Geography of a Changing Continent. Rowman & Littlefield. p. 98. ISBN 978-0-7425-0019-8. ^ a b c d Tucker, Spencer (2013). Almanac of American Military History. Volume I: 1000-1830. ABC-CLIO. pp. 10–11. ISBN 978-1-59884-530-3. ^ Havard, Gilles (2001). The Great Peace of Montreal of 1701: French-native Diplomacy in the Seventeenth Century. McGill-Queen's University Press. p. 66. ISBN 978-0-7735-2219-0. ^ a b Chartrand, René (2013). French Fortresses in North America 1535–1763: Québec, Montréal, Louisbourg and New Orleans. Bloomsbury. p. 4. ISBN 978-1-4728-0317-7. ^ a b Aquila, Richard (1997) . The Iroquois Restoration: Iroquois Diplomacy on the Colonial Frontier, 1701-1754. University of Nebraska Press. ISBN 0-8032-5932-8. ^ Meductic Indian Village / Fort Meductic National Historic Site of Canada. Canadian Register of Historic Places. Retrieved December 20, 2011. ^ Grenier, John (2008). The Far Reaches of Empire: War in Nova Scotia, 1710-1760. University of Oklahoma Press. pp. 51, 54. ISBN 978-0-8061-3876-3. ^ Prins, Harald E.L. (March 1999). Storm Clouds over Wabanakiak: Confederacy Diplomacy until Dummer's Treaty (1727). The Atlantic Policy Congress of First Nations Chiefs. Amherst, Nova Scotia. Retrieved 2013-09-16. ^ a b Clayton, W. Woodford (1880). History of York County, Maine: With Illustrations and Biographical Sketches of Its Prominent Men and Pioneers. Philadelphia: Everts & Peck. p. 51. ^ a b Chet, Guy (2003). Conquering the American Wilderness: The Triumph of European Warfare in the Colonial Northeast. University of Massachusetts Press. ISBN 1-55849-382-4. ^ a b c d Drake, Samuel Adams (1897). The Border Wars of New England: Commonly Called King William's and Queen Anne's Wars. New York: Charles Scribner's Sons. ^ a b c d e Church, Benjamin; Church, Thomas; Drake, Samuel G. (1845). The History of the Great Indian War of 1675 and 1676: Commonly Called Philip's War : Also the Old French and Indian Wars, from 1689 to 1704. New York: H. Dayton. ^ a b c Reid, John G. (1994). "1686–1720: Imperial Intrusions". In Phillip Buckner; John G. Reid (eds.). The Atlantic Region to Confederation: A History. University of Toronto Press. p. 82. ISBN 978-1-4875-1676-5. JSTOR j.ctt15jjfrm. ^ a b c d e Dunn, Brenda (2004). A History of Port-Royal-Annapolis Royal, 1605-1800. Nimbus. ISBN 978-1-55109-740-4. ^ Roach, Marilynne K. (2002). The Salem Witch Trials: A Day-by-day Chronicle of a Community Under Siege. Taylor Trade Publications. p. 163. ISBN 978-1-58979-132-9. ^ a b Taylor, Alan (2002). American Colonies. Penguin Books. ISBN 978-0-14-200210-0. ^ Trafzer, Clifford E. (2000). As Long as the Grass Shall Grow and Rivers Flow: A History of Native Americans. Harcourt College. ISBN 978-0-15-503857-8. ^ Exercises of the Eliot Historical Society on Monday the fifth of July, 1897: In commemoration of Major Charles Frost on the two hundredth anniversary of his massacre by the Indians, Sunday, July fourth, 1697. p. 16. Weidensaul, Scott (2012). "'Our Enimies are Exceedeingly Cruell'". The First Frontier: The Forgotten History of Struggle, Savagery, and Endurance in Early America. Houghton Mifflin Harcourt. pp. 182–221. ISBN 0-15-101515-5. Baker, Emerson W.; Reid, John G. (January 2004). "Amerindian Power in the Early Modern Northeast: A Reappraisal". William and Mary Quarterly. 3rd series. 61: 77–106. doi:10.2307/3491676. "King William's War" . New International Encyclopedia. 1905. "King William's War" . Collier's New Encyclopedia. 1921.